Seville is the birthplace of Spanish stereotypes: fruity sangria, passionate bullfights, and fiery flamenco. But it’s more than that. It’s the Sevillanos’ spirited nature, their never-changing Andalusian traditions, and the way they enjoy every day, not just the weekends. Those are the reasons that captured my heart when I came to Seville as a wanderlust-y exchange student in college. Seville was my gateway drug to Spain. The city lured me back again to live there – and eventually marrying a Sevillano. If you don’t know me, I’ve been living in Barcelona, Spain, for 10 years. I’m lucky to come back every year to see family and old friends, meander the shop-filled Calle Sierpes, and delight the lush orange trees overflowing the city streets with color. 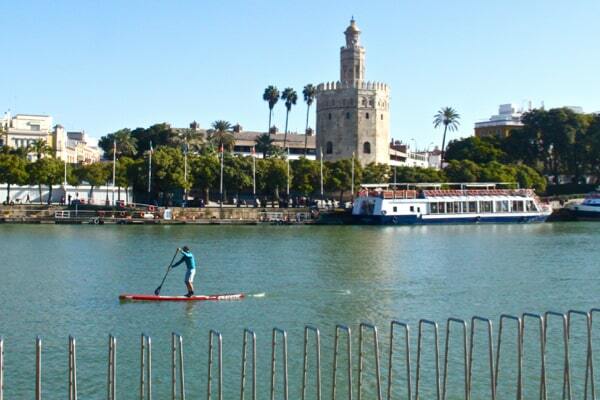 People from Seville are proud of their city – as they should be! So I hope you can enjoy it too. 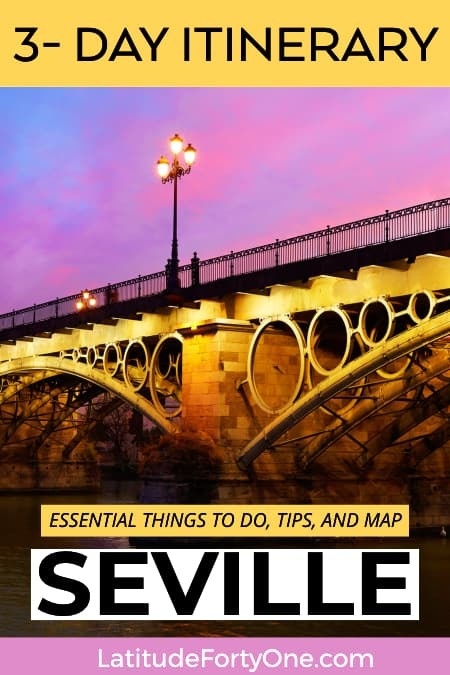 Find out how to spend 3 days in Seville: things to do and see! First up, if you’re coming to Seville, you’ll need a place to rest your head. The Barrio Santa Cruz is the best area to stay in Seville because of its proximity to the main attractions, restaurants, and nightlife. More than that, its tangled streets, fountain-filled plazas, and outdoor cafes make it a delightful area to wake up to or wind down at the end of the day. The other neighborhood to stay is El Arenal, a central neighborhood of Seville right next to the Barrio Santa Cruz. Around it is the Plaza de Toros and La Maestranza Opera House. Both areas are good places to stay if you want to spend some nights out partying as well. If not, try a Sunday brunch here in the elegant courtyard run by Restaurante San Fernando, which I’ve had. Recommended! There are two major places to visit in Seville that you’ll want to explore for a few hours: the Catedral de Sevilla and the Real Alcázar. Let’s start with the church..! 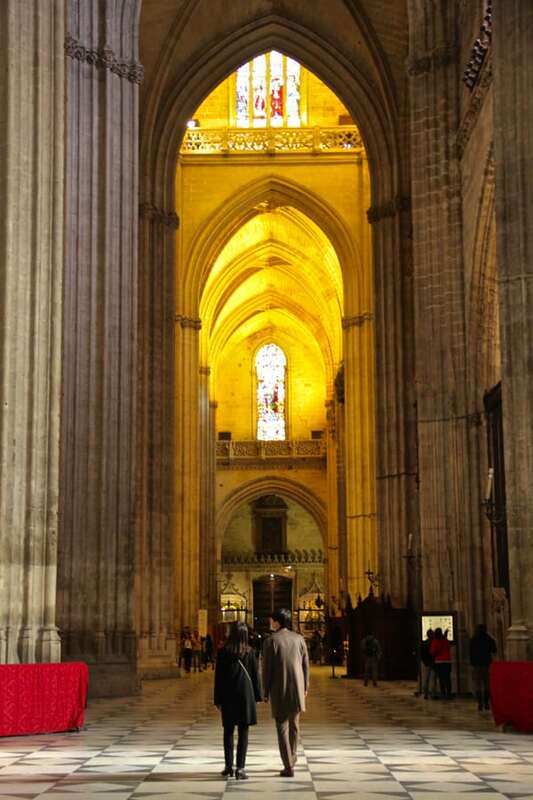 This imposing Cathedral (complete name: Catedral de Santa María de la Sede de Sevilla) is the largest Gothic Christian Cathedral with the most surface area in the world. It was originally an Almohade mosque in 1182, but throughout the centuries, newer additions were made after the Castilian King Fernando III transformed it into a Christian church. Its grandeur is almost overwhelming. The main nave is 42 meters high, and also have several side chapels, halls, and choir stalls. El Catedral de Sevilla is massive. 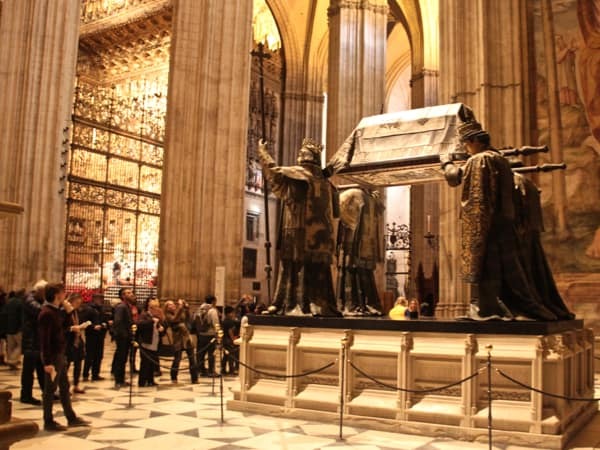 One of the most impressive Seville attractions is the decorous tomb of Christopher Columbus. Heard of him, right? Welp, the veracity of his remains was contested for many years, but 2013 DNA tests proved his remains are inside. Señor Colon is carried by four bearers representing the kingdoms of Leon, Aragon, Castile, and Navarra. The man of your history books lies in this tomb. Don’t miss the Patio de Naranjos on the north side, which you’ll be able to see if you go up the Giralda tower. This patio lined with 66 orange trees was originally the main courtyard of the mosque. The Giralda bell tower is part of the Cathedral. So if you pay to get into the Cathedral, you can access the tower. The Giralda tower was originally built in the 12th century and was a minaret (a tower that’s part of a mosque). It has 24 bronze bells and is one of the best Renaissance bell towers in Europe. The topper of the bell is a female figure that represents Faith. It’s called the Giraldillo, an iconic image you’ll see of Seville again and again. It was declared one of the UNESCO World Heritage sites. 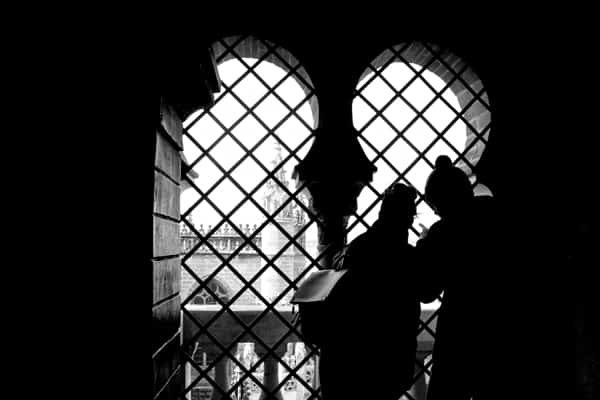 Going up the Giralda, step aside and see the Cathedral details. To go up the Giralda, you climb up 35 sloping ramps, which won’t kill your knees. 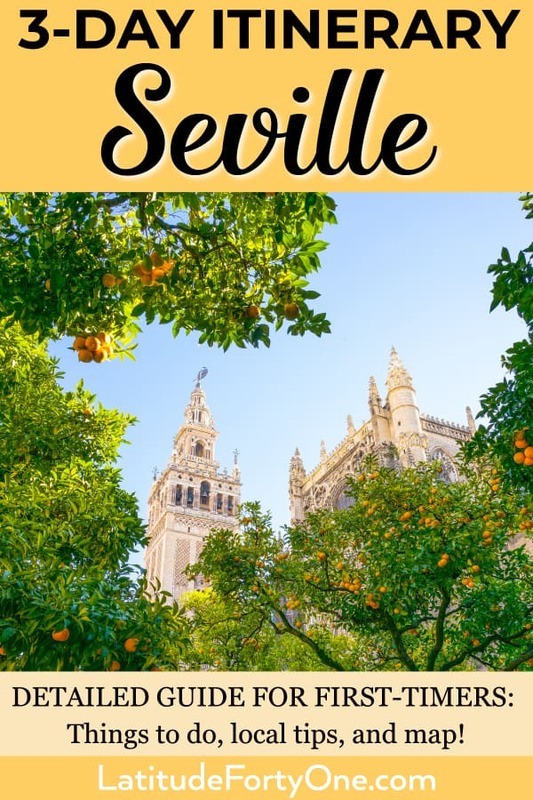 Once you reach the top, you can get a panoramic view of Seville: the details of the Sevilla Cathedral, a view of La Barqueta bridge, the bullring, and the new Torre Sevilla. But there are horizontal bars, so if you want to get a shot, you’ll have to slip your phone between the bars. AND if it’s super crowded, you’ll have to wait your turn to look out! It’s not the best place for a selfie – as it’s impossible to get an unobstructed view of the landscape behind you. If you happen to be there when the bells ring (like I was), cover your ears! Going up the tower is one of the best things to do in Seville as you get a bird’s eye view of the city. Time spent to climb: 10 minutes or more. You can step aside and pause in a small window area to take photos! Time to spend at the top: 15-30 minutes. 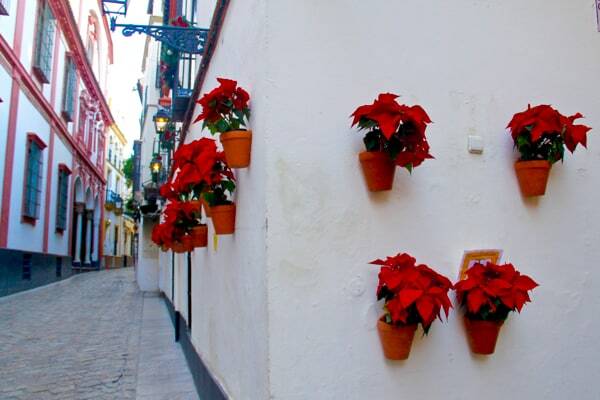 This is the old Jewish quarter of Sevilla, full of traditional Andalusian charm: potted flowers hanging on the wall, iron lamp posts, and quaint whitewashed plazas. The Santa Cruz neighborhood was one of the most important Jewish communities in Spain, until they were expulsed in 1483. The barrio’s narrow alleys also block the hot Sevillan sun in the summer (with some of the hottest temps of Spain in August). Some of the most charming squares are the Plaza de Los Venerables, Plaza de Santa Cruz, or Plaza de las Cruces. 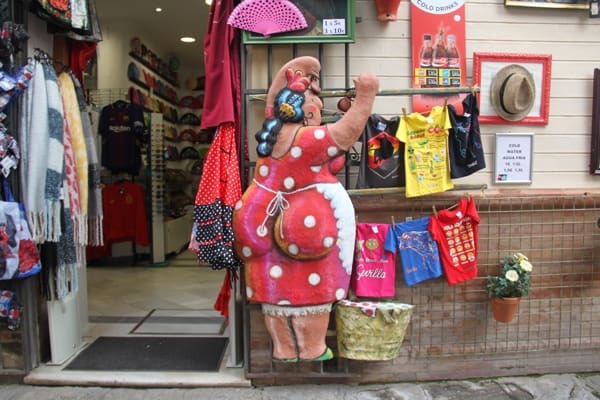 Note that the Barrio Santa Cruz also has a lot of cheesy tourist shops, bars of tourist traps, and trinkets as well. Time to spend here: 30 minutes to 2 hours if you want to shop, take photos, or have a meal. 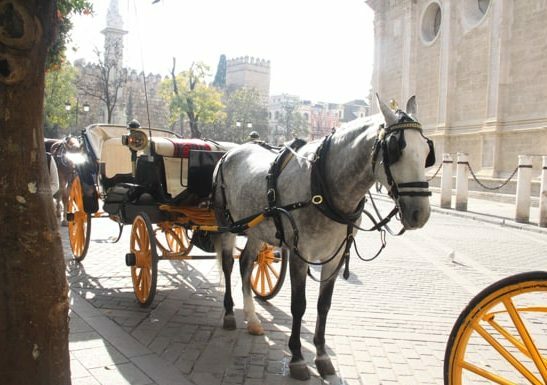 Next up…Explore El Centro of Seville to get your bearings. Check out the local vibe of densely packed streets and alleys. Zip through Calle Sierpes to see the bars, local shops of mantillas, fans, and leather purses and shoes. Stop by Plaza del Salvador, a popular square for chillin’ and drinking. 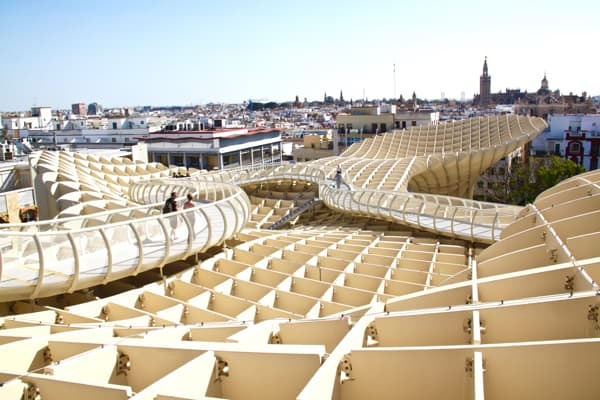 When it opened in 2011, the Metropol Parasol, also called Las Setas (“the mushrooms”) gave Seville a modern revival of a very traditional city. (It was also controversial.) Las Setas is a five-story, mushrooms-shaped wooden building with a honeycomb roof. On the ground floor is the Encarnación food market where you can find meats, fruits, and restaurants. Below ground is the Antiquarium Museum, a museum of archaeological remains from the Roman period. But the best part of Las Setas is the 360º panoramic views at the top and the paths around it. Take advantage of the binoculars around too! To further soak in the view, you can have a drink at the restaurant bar as well. Get the best views of Seville from the top of the ‘shrooms. Unfortunately, you can’t buy your tickets in advance – you’ll have to queue like everyone else. Access is on the basement level. The least crowded times to go are when it opens in the morning (at 10am), at the end of the day. And also 3pm – when every Spaniard is sitting down eating lunch. Because they’re clockwork like that. Be prepared to stay a few hours at the Real Alcázar. To enter, head to the Puerta del Leon. (I ended up circling the whole complex to find the entrance.) With your ticket, you’ll get an informational pamphlet and an audio guide to go with your tour. Here’s a tip: bring your own headphones. You can attach it to the phone jack and hang the audioguide around your neck with the lanyard so you can have your hands free. 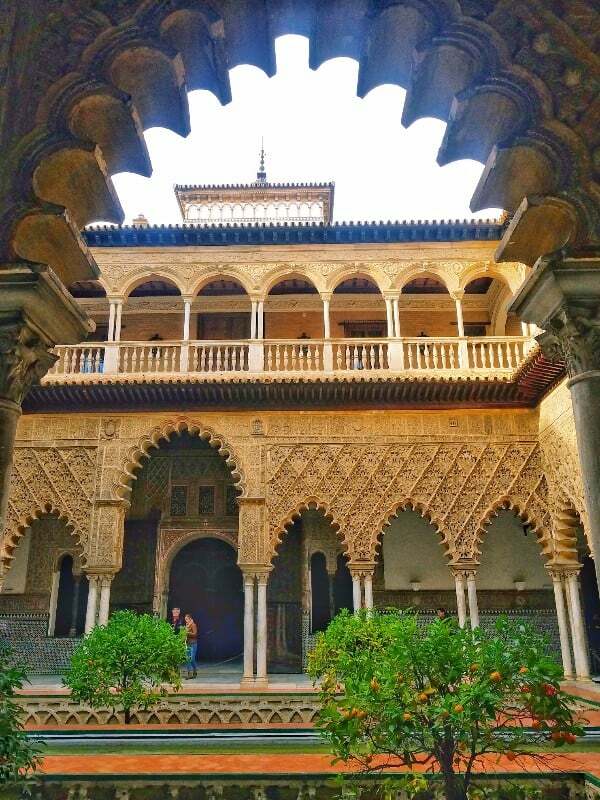 One of the oldest palaces in the world, the architectural influences of the Real Alcázar are a complex mishmash of Mudéjar, Islamic Gothic, Renaissance, and baroque architecture. It’s evident in the dramatic arches, ornate tiling, and golden ceilings. If you’re a “Game of Thrones” fan, you’ll recognize some places like the Salón de Embajadores, Estanque de Mercurio, or the Gardens of the Real Alcázar. 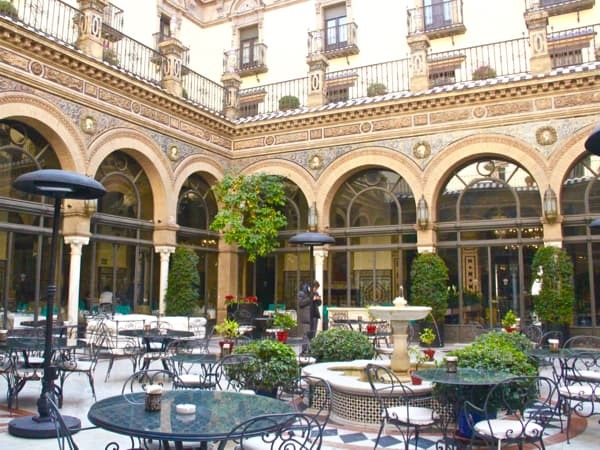 Visit the Patio de las Doncellas, a small oasis of marble columns, an orange tree garden, and a rectangular fountain. PRO TIP: Be sure to buy your tickets ahead of time! I was going to buy my ticket on-site, but there were long queues. So I grabbed my phone and bought my tickets on the Real Alcázar website. I was able to schedule a visit within the hour. I went to the shorter line (there are two, the one on the left), which was for reservations. Arrive about 15 minutes ahead of time just in case. You don’t want to miss your window! Admission: 11.50. Buy your ticket online first! It really takes a few hours to explore! 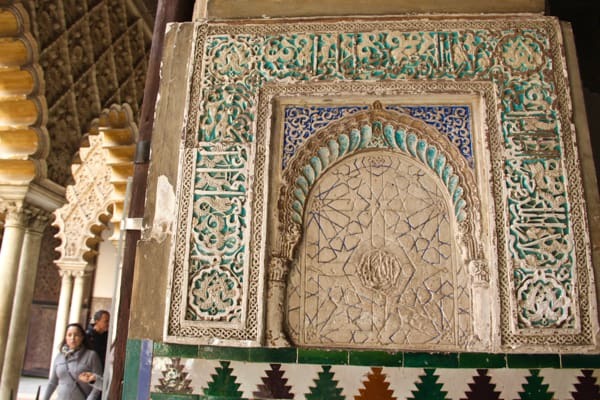 For a better understanding of the Real Alcázar, why not try a tour? When Christopher Columbus came back from “the New World” in the 15th century, he brought back with him the tobacco plant. The tobacco trade was established here first in Europe, and for centuries, Spain was the ONLY producing country of snuff. Hence, they built the Real Fábrica de Tabacos, the first industrial building of its kind and is also one of Spain’s largest buildings. Today the Royal Tobacco Factory building houses the University of Seville (I actually went here), and it’s worth a peek inside if it’s open – it won’t take long! The Royal Tobacco Factory is also the setting of the famous opera, Carmen, the story is about love, jealousy, Don José, and a cigar factory worker, Carmen. For a quick brush-up and to get your pumped for your Seville trip, check out the film, Carmen with Paz Vega. I guarantee you it’s better than Beyonce’s version for MTV, “Hip Hopera”. 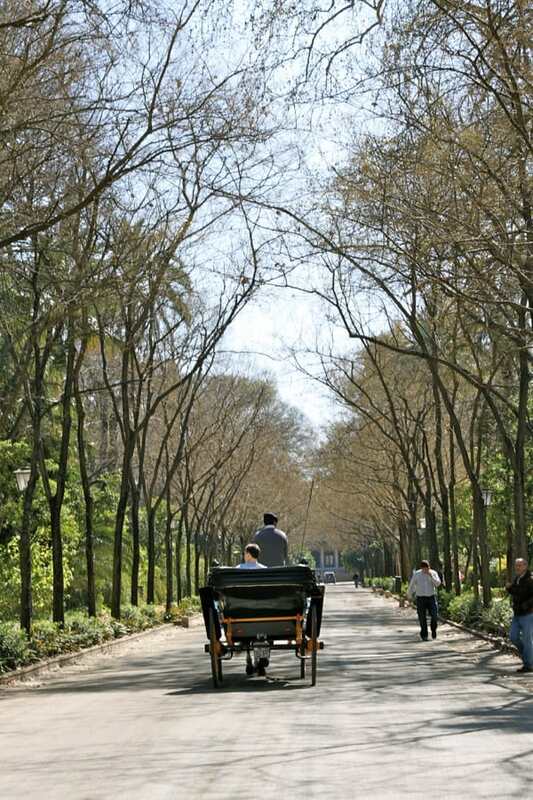 A romantic oasis, the Parque de María Luisa is the city’s main park, and it’s more than an extensive garden. It houses cultural buildings like Lope de Vega Theatre, the beautiful neogothic Pabellón Real, the Museo Arqueológic (Archaeological Museum), and the Museo de Artes y Costumbres Populares (Arts and Customs Museum). Climb up the Monte Gurugú to the mini lookout point and get a view of the park. Its beautifully tiled benches, flowing fountains, and precious pavilions will make you feel like you’re a romantic French garden. A super fun activity to enjoy the park is the rent a four-person quad bike for 12€ for 30 minutes. Inside this park is perhaps one of the most iconic Seville sights, the Plaza de España, a square that was built for the 1929 Iberoamerican Exposición. It’s adorned with a semi-circular canal, tiled benches representing each province in Spain. There are now flamenco dancers holding street performances! It’s also the location of film and TV productions like “Star Wars: Episode II – Attack of the Clones” and “Lawrence of Arabia”, and “Game of Thrones”. A fun way to enjoy the square is to row a boat in the canal for 6€ for 35 minutes. Opening hours: 24hours. It’s a public space and free to enter. 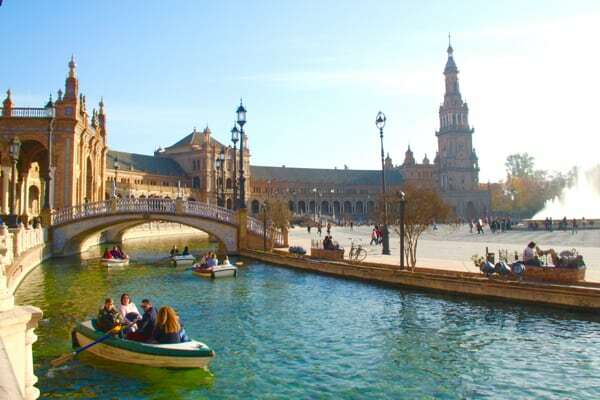 Row, row, row your boat in the Plaza de España. That’s it for Day 2. And night time is the right time! Want to go out and have a drink? Head to La Alameda, a once-gritty part of the city, and is now is a leafy haven of cool bars, shops, and restaurants. 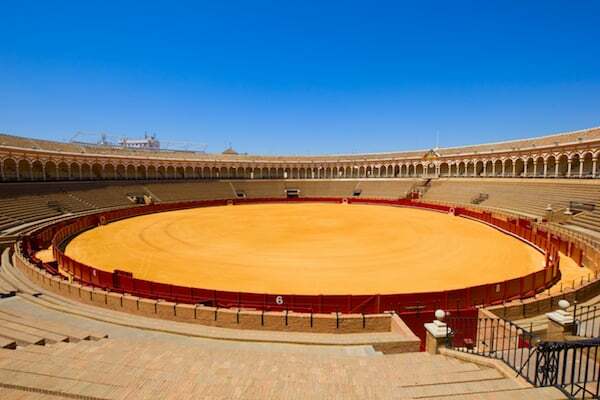 The Plaza de Toros, or the Real Maestranza de Caballería de Sevilla, is the oldest – and one of the most beautiful – bullrings in Spain. While bullfighting is a controversial issue, the blood sport is legal in Andalusia (unlike other regions like Catalonia, where it was banned in 2013.) The bullfighting season starts on Easter Sunday. Inside is also the Museo Taurino, where you can learn about the sacred tradition and see old bullfighting paraphernalia, paintings, sculptures, bullfighters’ complete garb, and dressing rooms. You can even see busts of iconic bullfighters like Curro Romero and Joselito “el Gallo”. Also visit the chapel where matadors go to pray before the bullfight, in hopes they don’t get their guts gouged out. Morbidly curious (and young), I have seen a bullfight here. Why is seeing a body of water so calming? It’s a refreshing view from the Triana Bridge. It’s fun to watch see passenger boats, kayakers, and people chilling alongside the riverbank of the Río Guadalquivir. 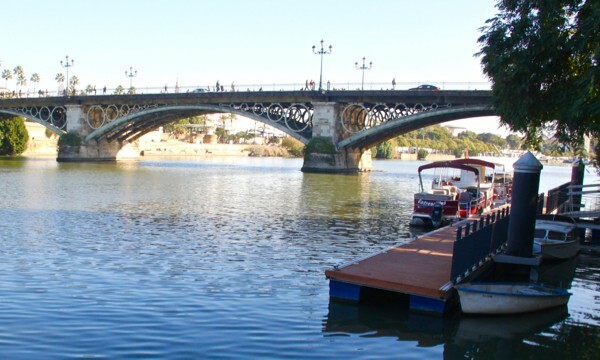 The Puente de Isabel II is made of stone and iron, and it’s the oldest bridge in Seville. If you can imagine, Magellan himself rode these river waters in 1519, venturing forth to circumnavigate the world. 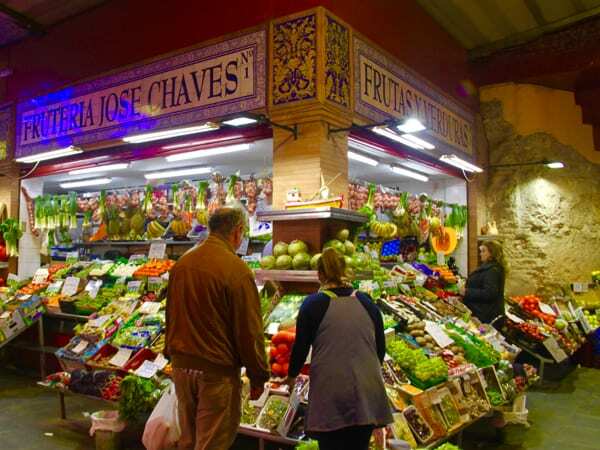 The beautiful tiling, the colorful fruits, the variety of stands, the boisterous shopworkers… This food market is a serious contender against the Mercat de La Boqueria in Barcelona. But it’s not just a market. It has sit-down restaurants, tapas bars, local goods stands, a culinary workshop space, and even “the smallest theatre in the world” with just 28 seats available, where they have evening flamenco shows for 20€ (https://casalateatro.com/). If you want a fun eating experience and cool Instagram story ;-), listen up. Go to La Casa Fundida and order a chorizo al infierno. It’s a tapa of Spanish sausages that they set on fire! We had it with a beer (and complimentary bread). It will cost you about 5€ I can’t find that price in Barcelona! 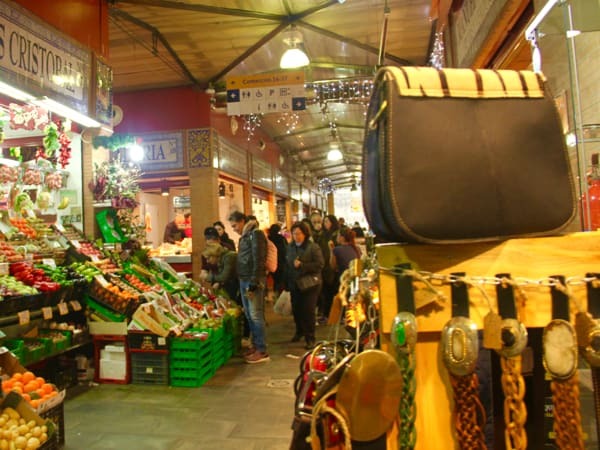 A no-miss Seville sight: the Triana market. If you’ve seen the elaborate hand-painted ceramics around Sevilla, chances are they were produced in Triana. The azure blues, golden hues, and images of a majestic Virgin Mary decorate the city with these handpainted ceramic goods. They’re not as expensive as you think, so some ceramic bowls or mugs would make a fantastic handmade souvenir. 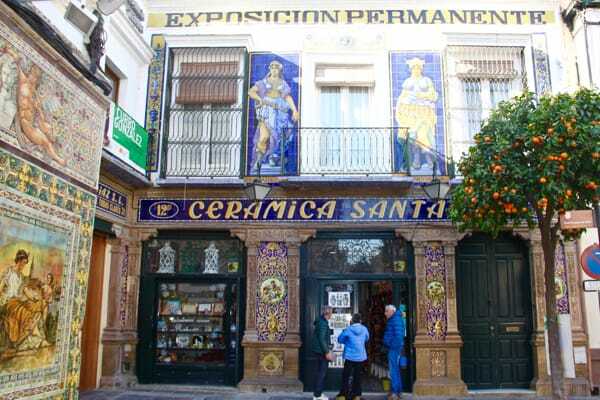 A popular shop is the large Cerámica Santa Ana, an extensive array of traditional and modern designs. I wish I could share the photos I took here, but apparently, no photos are allowed (I realized afterward). Time to spend here: 30 minutes to 1 hour (or more…!) Visit the other ceramic shops nearby on Calle San Jorge and Calle Antillano Campos, they’re hard to miss. The Torre del Oro (“Tower of Gold”) is an emblem of Seville, small in stature compared to other international monuments, but it’s an important symbol of the city’s historical wealth. Built by the Arabs, it was a defensive tower and was also used to control the river traffic. It was also a place to store the riches like wines, silks, and spices. If you want to go inside (not a Seville must-see but still cool), you can visit the Museo Naval Torre del Oro (Naval Museum). It’s the last day, so now what?! You may have some time left, so walk down the Avenida de La Constitución, a lively street of bars and cafes. Then meander around El Centro, the Seville old town, around Calle Tetuan and Plaza Nueva. For more interesting Seville top attractions, try the Casa de Pilatos, a 15th-century mansion or the Museo de Bellas Artes (Museum of Fine Arts), where you may recognize classic works from renowned artists like Goya or Velázquez. Tapas bars in Seville can be crowded and intimidating. Be brave – go in there and enjoy the Andalusian gastronomy! You’ll see that locals like to sit (or stand) outside to eat and enjoy each other’s company. They live a strong social life through their meals. Below are some recommended restaurants that I’ve been to and are on the map at the bottom of the page. 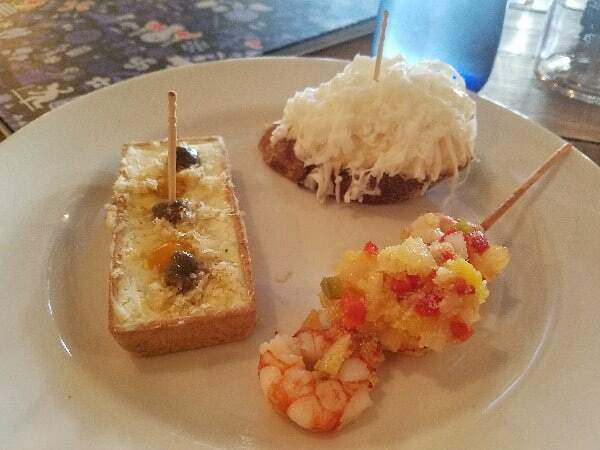 Get charged for your pintxos with the toothpick system. Schedule. Spaniards are late getter-uppers, late lunchers, late dinner-ers, late everything. (Or maybe they’re on time, and I’m always early?). Lunch is around 2:30pm, so sometimes the kitchen closes at 4pm. Dinner is around 10pm (at home), but eating tapas can start at 8pm. For lunch, if you don’t want to share tapas, you can order an individual menu del día. It’s only offered at lunch, and it includes a first dish (kind of an appetizer), a second main dish, dessert, and drink. They’re designed to be affordable. To tip, locals round up to the nearest euro. If you’re feeling generous or maybe had a fancy meal with great service, 5-10% gratuity is fine. If you’re American, you’ll feel like a cheapskate, but no one will gawk at you. Customer service. Again, my US compatriots: you may be disappointed that you won’t get the over-the-top customer service like at home. Ordering is swift and usually friendly. There’s no chit-chat about how your day was. No “How is everything? *extra smile*” every 15 minutes. If you need a drink or a fork or whatever, try to flag any waiter available. There is no “your server” that gives you his first name when he seats you. Every server is your server. Jamón ibérico – The national tapa, jamón ibérico is a cured ham often eaten…well anytime. You can have it in a sandwich on your toast, as a snack as a small bocadillo (sandwich), or even for lunch. It’s even a tapa before dinner! There are different kinds, but for top-of-the-line, go for jamon ibérico de bellota, a special ham in which the pig is fed bellotas, or acorns. Gazpacho – Get the real deal in Seville! This cold tomato-based soup has tomatoes, cucumbers, green peppers, and garlic and is best consumed on a hot summer day – or any time of the year. It’s great for dipping bread – or some people drink it straight! It’s also suuuuper easy to make at home. Solomillo al whiskey (pork tenderloin in whiskey sauce) – This is a braised tenderloin paired with a sweet whiskey sauce. It’s often accompanied with crispy potatoes. Try this!! Espinaca con garbanzos (spinach with chickpeas) – a very sevillano dish (that’s actually quite easy to make at home), is this simple stew that’s heart-warming, especially in the winter. Its Arabic and Middle Eastern influences can be tasted in the hint of cumin that gives the dish its depth. Very healthy and delicious! Berenjenas fritas con miel (Fried eggplants with honey) – Vegetables never tasted so good. The eggplants are lightly breaded and lightly fried, then drizzled on with honey. A must-try! Cruzcampo beer – this is the most popular beer in Sevilla, and the best-selling beer in Spain. You’ll recognize the red-colored brand with the image of Gambrinus, a Flemish duke holding up an icy one. Cruzcampo is a light beer with a golden color ale, meant to be refreshing on those hot summer Sevillano days. 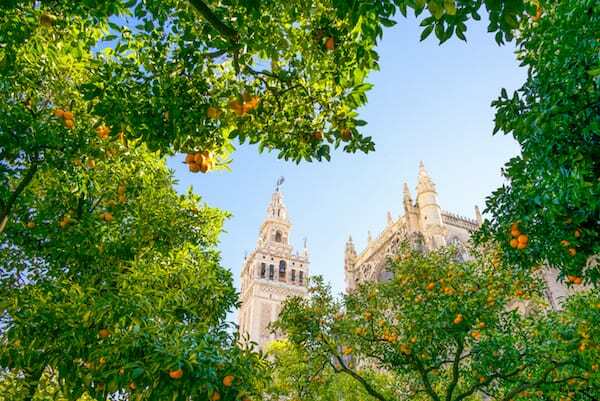 If you ask a Sevillano when’s the best time to go to Seville, they’ll probably tell you “in the spring”. The jasmine flowers are blooming for just two weeks, infusing the whole city with the aroma (mixed in with horse poop smell). It’s also the…Feria de Abril! Which isn’t just in April but a spring fair. It’s celebrated one or two weeks after Holy Week and lights up the city. It’s a huge deal. The horses around the city are beautiful, but you have to dodge horse poop. Cadiz: This was named the top city in 2018!! You can easily leave and come back in a day at the beach, as I’d done it many times! 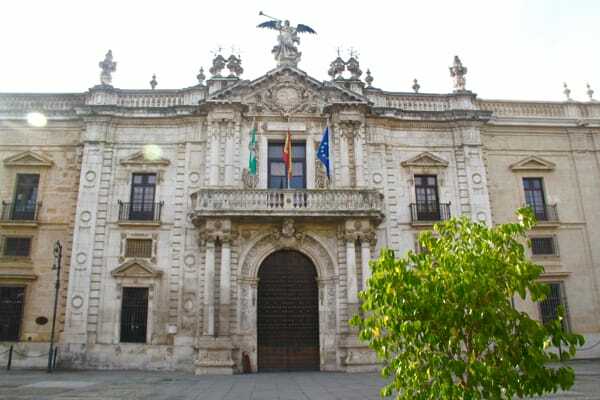 Carmona: Carmona is one of the easiest Seville day trips to make, just 30 minutes south of the city. It’s a quaint town with a Roman settlement and also a necropolis, a huge burial ground. Read my post about Carmona here. Go to the Plaza de Armas bus station and buy a ticket. Sevilla is a walkable city, and you could see all the major sights around Barrio Santa Cruz and Arenal neighborhoods. But if you want to explore a little and go further afield, they have a decent bus system run by Tussa. Go to a kiosk and buy a plastic rechargeable card if you plan on taking it more than once. 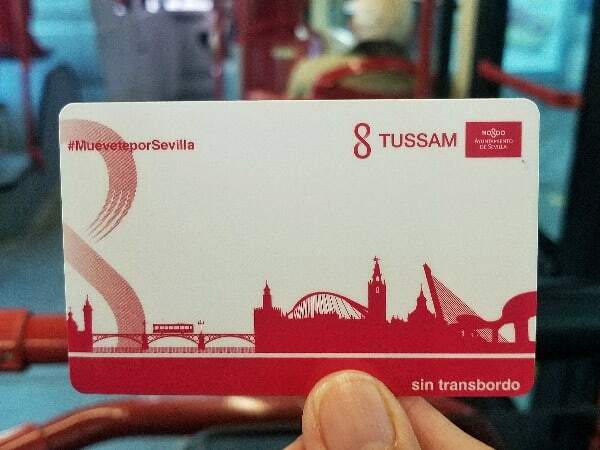 A bus card could be useful to go to the bus station or Santa Justa Train Station if you want to take day trips out of Seville. If not, pay for your ticket on the bus, which costs 1.40€ each way. The Tussam bus card… and I need a manicure. 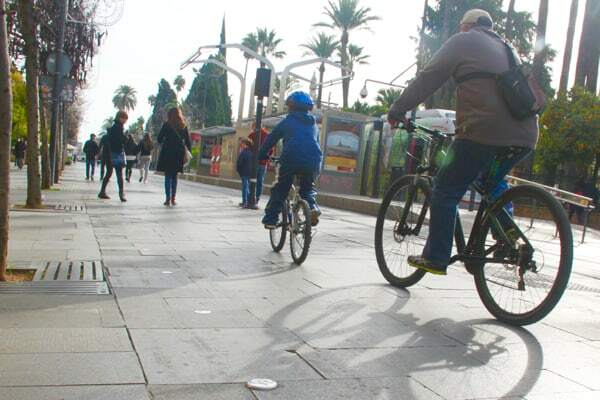 Biking: Biking is slowly catching on in Seville. There are built-in bike lanes, but where it ends and begins isn’t so obvious. Beware of bikes and the very silent trams, especially around Avenida de La Constitución. See those almost-invisible circles on the floor? That means it’s a bike lane. If it looks like people are speaking angrily, flailing their hands in the air, it’s a normal way that Spanish people talk. LOL, this was my first impression when I came here. Everyone used to ask me if people were angry. No, they just talk with their hands. Something people always ask me, What does “vale, vale, vale” (pronounced “bah-leh”) mean? It means “OK, OK, OK”! When you go inside a shop, it’s common to greet the shopkeeper with a simple “Hola”, or “Adios” when you exit. If you’re an English speaker and want to try out your Spanish, you may have a hard time understanding the locals as their accent cuts out syllables of some words. It’s the acento Andaluz! Rick Steves, the man who’s been traveling before the Internet was born, has a handy app called “Rick Steves Audio Europe” that’s fun to listen to if you want to learn about Spain while you’re traveling. Whew, that’s it! It’s hard for me to talk about these places in Sevilla without wanting to insert a memory attached to each place – as I frequented many spots time and time again. I mean, I can’t forget the time when I was almost homeless, the time I met my now-husband, or the fun botellones (drinking in public) with my friends in the Alfalfa. LOL! So I hope this post helped! 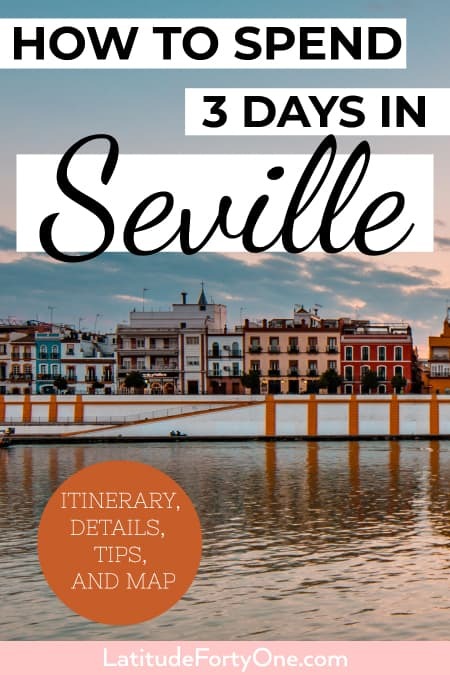 Have you been to Sevilla? Would you add anything?